The Second Crusade (1147–1149) was the second major crusade launched by the Roman Catholic Church, called in 1145 in response to the fall of the County of Edessa the previous year. The Second Crusade was announced by Pope Eugene III, and was the first of the crusades to be led by European kings. 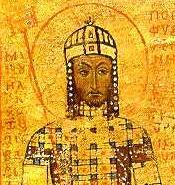 The armies of the French and the German kings marched separately across Europe and were somewhat hindered by Byzantine emperor Manuel I Comnenus. Prior to the arrival of the Crusaders, Manuel had broken off his military campaign against the Sultanate of Rüm and signed a truce with his enemy Sultan Mesud I. This was done so that Manuel would be free to concentrate on defending his empire from the Crusaders, who had gained a reputation for theft and treachery since the First Crusade and were widely suspected of harbouring designs on Constantinople. Some of the French were outraged by Manuel's truce with the Seljuks and called for an alliance with Roger II of Sicily and an attack on Constantinople, but they were restrained by their King. After crossing the Byzantine Empire into Anatolia, both the French and German armies were separately defeated by the Seljuk Turks. The remnants of their armies reached Jerusalem and, in 1148, participated in an ill-advised attack on Damascus. The crusade in the east was a failure for the Crusaders and a great victory for the Muslims. It would ultimately lead to the fall of Jerusalem and the Third Crusade at the end of the 12th century. 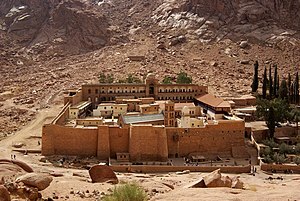 Saint Catherine's Monastery, an Eastern Orthodox monastery which lies in Saint Catherine, Egypt, on the Sinai Peninsula. Established between 548 and 565 AD, it is recognised by UNESCO as one of the oldest working Christian monasteries. ...that Abraham of Farshut founded a new Monophysite monastery at Farshut after the monks of his old monastery at Pbow almost all accepted the decision of the Council of Chalcedon? Saint Justinian, 482 or 483 CE – 13 or 14 November 565, was the second member of the Justinian Dynasty (after his uncle, Justin I) and Eastern Roman Emperor from 527 until his death. He is considered a saint amongst Eastern Orthodox Christians, and is also commemorated by the Lutheran Church. One of the most important figures of Late Antiquity, Justinian's rule constitutes a distinct epoch in the history of the Byzantine Empire. The impact of his administration extended far beyond the boundaries of his time and empire. 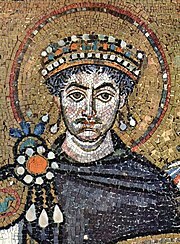 Justinian's reign is marked by the ambitious but ultimately failed renovatio imperii, or "restoration of the empire". This ambition was expressed in the partial recovery of the territories of the Western Roman Empire, including the city of Rome itself. A still more resonant aspect of his legacy was the uniform rewriting of Roman law, the Corpus Juris Civilis, which is still the basis of civil law in many modern states. His reign also marked a blossoming of Byzantine culture, and his building program yielded such masterpieces as the church of Hagia Sophia, which was to be the center of Eastern Orthodox Christianity for many centuries. A devastating outbreak of bubonic plague in the early 540s marked the end of an age of splendor. The empire entered a period of territorial decline not to be reversed until the ninth century.